As avid dog-lovers, the kinds of holidays that involve our furry friends are some of our favorite holidays to celebrate here at the Visitors Bureau – such as Walking the Dog Day! We like to think that dogs are actually the ones responsible for this holiday in an effort to get their humans off their couches and on the other end of a leash, but who knows. Its true origin remains a mystery, but we’ll take any excuse to get our fur babies outside and get some fresh air. Take your dog along the very grounds Abraham Lincoln walked as a boy and wander trails where you’ll encounter replicas of pioneer cabins, the gravesite of Lincoln’s mother, and more. A rural paradise, you’ll love the scenic views along the trails here. Enjoy six different trails varying from 1.5 miles to 3.7 miles long, and two beautiful lakes. Named after a legendary and jolly man who helped shape the town of Santa Claus, Jim Yellig Park is a cute, local recreational park. 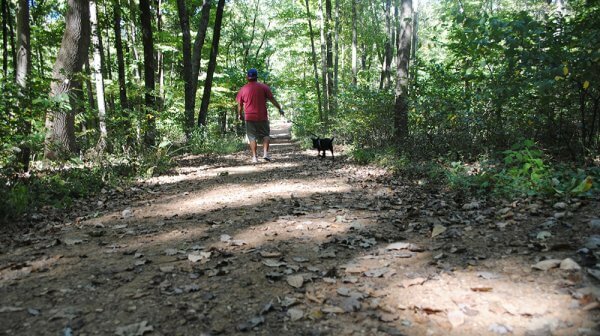 There are convenient walking paths throughout the park to mosey along. Along the mighty Ohio River in Spencer County, you’ll find various stops to meet your dog-walking desires, including Lincoln Ferry Park and the stunning Rockport Bluff. Saunter around the serene, breathtaking grounds of the Saint Meinrad Archabbey. Pooches need a little peace, too! So grab your tennis shoes, your fur baby, and get going! This blog post has been updated from February 2017.